DORCHESTER, Massachusetts (CNN) -- A bell tolled atop Boston's Faneuil Hall on Thursday as the body of Sen. Edward Kennedy passed through the streets, while mourners lined up outside his late brother's presidential library for a chance to say goodbye. 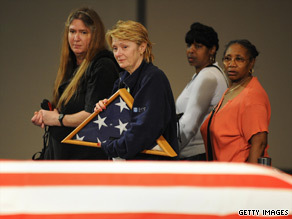 Members of the public file past Sen. Edward Kennedy's coffin at the John F. Kennedy Presidential Library. Kennedy lay in repose Thursday evening after his flag-draped casket arrived at the John F. Kennedy Presidential Library from the family's Hyannis Port compound on Cape Cod, Massachusetts. An estimated 1,600 people had lined up to view the casket as of 5 p.m., an hour before friends, family and constituents began to file past. CNN covers the life and death of Sen. Ted Kennedy, including the memorial Friday night and the funeral Saturday. At least 40 of Kennedy's fellow senators and former presidents Jimmy Carter, Bill Clinton and George W. Bush are expected to attend Saturday's funeral at Our Lady of Perpetual Help Basilica in Boston's Mission Hill section, a short distance from the library. Kennedy will be buried Saturday evening at Arlington National Cemetery, outside Washington. Kennedy is eligible for burial at Arlington due to his congressional service and his tenure in the Army from 1951 to 1953. The proposed gravesite is 95 feet south of the grave of Sen. Robert Kennedy, which is in turn just steps away from John Kennedy's burial site. Bad weather could affect Saturday's ceremonies. Tropical Storm Danny, now churning east of the Bahamas, is expected to brush the East Coast and be near Cape Cod by Saturday evening. CNN's John King, Alec Miran and Barbara Starr contributed to this report.